The ecological attractions in Mwaluganje are diverse with scenic beauty such as the great natural forests, awe-inspiring cliffs and the warm blue Indian Ocean. Other natural attractions are “God’s Bridge,” “Time Rock” and the traditional shrine that characterizes the sacredness of the community. Elephants Experience: -Elephants are the main attraction at the sanctuary, and there are as many as 150 residing there. Mwaluganje is a historical bull area where independent elephant bulls grow in preparation for the demanding life of breeding males. Their families live in the neighboring Shimba Hills Reserve and Mwaluganje forest. On occasion, family groups visit males during the mating season, or cross the sanctuary as they travel between feeding areas. Once or twice a year, several related elephant families join up and travel as a unit of 200 females and calves (of all ages). 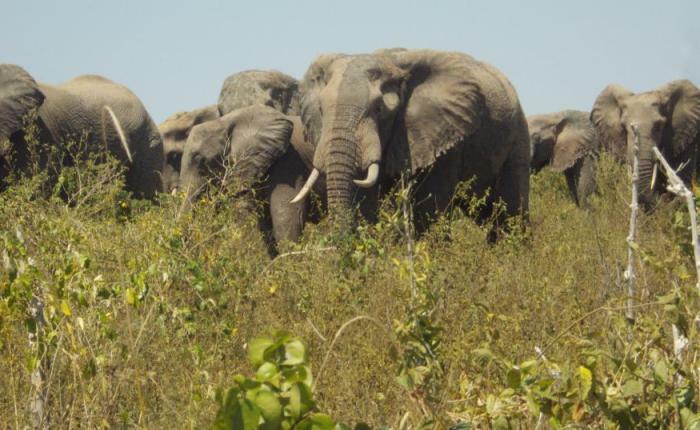 They gather in the Shimba Hills and move into Mwaluganje during the rainy season (December, and March/April). Such large herds usually last for no longer than three to four days, and are consequently a rare and magnificent sight to see. Like human families at reunion, these gatherings are marked by noisy greetings (i.e. trumpeting). is to protect the endangered wildlife between Mwaluganje national park and Shimba Hills national park. The aim is to find a solution to integrate the nature, wildlife and the people. As part of the project work, you will survey and monitor threatened species, such as elephant, buffalo and many sorts of antelopes. You will discover how to interpret wildlife tracks and signs and bring the plight of this region to the attention of the international scientific and conservation community. Volunteers and the community have been working hand in hand to protect the wildlife and nature in general. They have already achieved positive results in limiting human vs. wildlife conflicts. The sanctuary is open 7 days a week from 8am to 6pm for pupils and in this project, there are morning and afternoon activities, so volunteers can take the morning or afternoon duties or both according to their preference. You will receive an orientation at the beginning of your programme in Nairobi Kenya and then at the project together with the community. It will cover what you can get involved with at your project, how to stay safe and the opportunity to ask any questions that you may have. Accommodation is provided in a family who are also members of the project, in order to feel integrated and also enjoy more cultural aspects. Volunteers always have a private bedroom and all meals are provided within the family that’s to say breakfast, lunch and dinner. Volunteers are allowed to introduce their food from their own culture. Throughout your stay in Mwaluganje community, you will have the support and guidance of our native wildlife sanctuary project coordinators. They will provide you with competent assistance and help you with anything that you may need. Qualifications: No qualifications are needed.